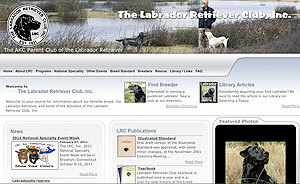 Using a website like the TheLabradorClub.com can help you make an informed decision on selecting a retriever breed. Maybe you're thinking about buying your first retriever puppy after years with pointing dogs or spaniels. Maybe you want a retriever as your first-ever hunting dog. Maybe you've recently lost your retriever-of-a-lifetime and just aren't up to replacing him with another of the same breed. Maybe a lot of things. But for whatever reason, you want a retriever puppy, and you haven't yet selected the breed. You can learn about retriever breeds in many ways: books, magazine articles, hunting buddies, retriever pros, field trials, hunt tests and so on. But you can best begin your search by visiting the Web sites of the national breed clubs sponsoring each of our retriever breeds. (See the sidebar, where you'll find Web site addresses for our seven retrievers, plus two spaniels that many favor as retrievers.) Here are the kinds of information you can expect to find on such a Web site. Each Web site carries the "Breed Standard," a written description of the breed's ideal physical and temperamental makeup. Dog show judges use this as their guide in evaluating and placing dogs of this breed. In your initial reading, concern yourself only with size (height and weight) and coat (length and texture). For now, you can skip all the technical stuff about angulation fore and aft, topline, tail-set and so forth. The standard should also include posed pictures of ideal representatives of the breed. After you've read about the breed's size and coat, you'll find these pictures more helpful than the written jargon. Then, too, most Web sites carry an ever-changing variety of pictures of different dogs: hunting pictures; field trial, hunt test and working certificate pictures; obedience trial and agility pictures; tracking pictures; and dog show pictures. Taken together, these photos give the visiting neophyte a clear notion of what the breed looks like, both in repose and in action. The standard also has a description of the ideal temperament for the breed, which will give you at least an initial notion about the breed's personality. The Web site should also offer a fairly extensive history of the breed. This will tell you what kind of people developed the breed, when and why. Every breed changes through its decades, or even centuries, of existence--but not all that much. If, as you read this history, you find yourself liking the people who developed the breed, you have probably found some kindred spirits. Therefore, you'll almost certainly enjoy the breed's personality. Why? Because those who develop dog breeds unconsciously select breeding stock with personalities much like their own--and therefore, in this case, like yours! Opposite personalities may attract, but similar personalities more often live happily ever after together. Most Web sites have an ever-changing collection of breed articles, some written by club members specifically for the Web site, and others reprinted from commercial magazines (like Gun Dog). These will give you a more contemporary understanding of the breed, especially with regard to temperament, personality and performance in the field. Most breeds are prone to one or more hereditary health problems, such as hip or elbow dysplasia, heart disease, cataracts, progressive retinal atrophy, cancer, epilepsy and so forth. National breed clubs expend much effort and money in helping breeders eliminate these hereditary problems from their breeding programs. One shining example: Back when hip dysplasia first became a known problem, the Golden Retriever Club of America (GRCA) started encouraging golden breeders to X-ray their dogs' hips to determine whether they had the disease, and to breed only those found free of it. Eventually, the GRCA gave their records to the veterinarians who founded the Orthopedic Foundation for Animals (OFA) to extend this practice to all breeds. Breed Web sites carry information about the hereditary health problems affecting each breed. Puppy buyers should seek this information, for it will help them find hereditarily healthy litters of puppies. Each breed Web site lists contact information for all club officers, committee chairs and so forth. From one of these (for example, the chair of the field committee), you can locate nearby club members who are interested in hunting. If you contact one or more of these, they will almost certainly invite you to watch their dogs work in the field, probably in a training session. If you get multiple invitations--dog folks love to show off their beasties' talents--accept as many as you can. If you eventually decide to buy a puppy of that particular breed, you should try to join one of these training groups. It may not take a village to train a retriever, but three or four fellow fanatics certainly helps. Each breed's Web site also tells you when and where the club's next annual "national specialty" will take place. Most national breed clubs move them around the country from year to year to make them accessible to more people. Some clubs also have annual regional specialties, with each region constituting approximately one time zone. At any of these specialties, in a few days you can see many dogs of a specific breed competing in various activities. You can also meet more knowledgeable people devoted to that one breed. Thus, by attending a specialty for any breed you're considering, you'll learn more about what they're really like in a few days than you could in years of less concentrated research. The national specialty is the club's annual "Big Hoorah," not unlike the early American mountain men's periodic "Rendezvous." It may last three to 10 days, depending on the popularity of the breed. The more popular the breed, the more people and dogs that will be competing, so the longer the specialty will last. But large or small, at a specialty you'll find many dogs of one breed in many different activities: field trials, hunting tests, working certificate tests, conformation shows, obedience trials, tracking trials and agility trials. Although you're mostly interested in field events, don't turn your nose up at the other games being played there. The obedience and agility trials offer lots of action at awe-inspiring training levels. The tracking tests are harder to follow as a spectator, but still interesting. At the conformation show, you'll learn what the best physical specimens of the breed look like. Besides, winning a conformation title doesn't prevent a dog from having working ability any more than winning a beauty pageant prevents a young woman from having great retriever-training and wingshooting skills. Of the three field events (field trial, hunting test and working certificate test), focus mostly on the hunting test. Field trial tests are so complex and challenging that you won't easily relate them to your "real world." The working certificate tests vary so much from breed to breed that no general statement could cover them all. Devote most of your spectating time to the hunting test. Even here, you must be selective whenever two testing levels run concurrently in different locations. Concentrate on the middle level, called the "senior," where dogs do hunting-like double marks and single blind retrieves on land and in water. I call this level the "hunter's level," because the tests are all the typical hunter-trainer needs from his dog. The lowest level, the "junior," requires only single marks on land and in water. I label it the 'beginner's level," because its tests are just a good start. The highest level, the "master," has extremely difficult triple mark and double blind retrieves on land and in water. I deem this the "trainer's level," because it appeals mostly to the trainer-hunter who wants to take his dog to a much higher training level than is absolutely necessary for everyday hunting. While spectating at the hunting test, you'll become acquainted with people who hunt this breed of retriever. From them you can learn much about the breed. Ask questions and listen, listen, listen. Of course, each national or regional specialty has a banquet and countless parties (planned and impromptu), so if you're the social type, you'll enjoy every minute you spend at the specialty. After selecting a breed, consider joining its supporting national breed club. Through its newsletter, the club will keep you informed about what's happening in your chosen breed. It'll also offer you many opportunities to get involved with the breed and the club. And it will keep you close to others in your breed all over the country. * The Toller has separate national breed clubs in Canada and the U.S.
** The Boykin Spaniel has two national breed clubs in the U.S.: Boykin Spaniel Society (BSS) and Boykin Spaniel Club and Breeders Association of America (BSCBAA).